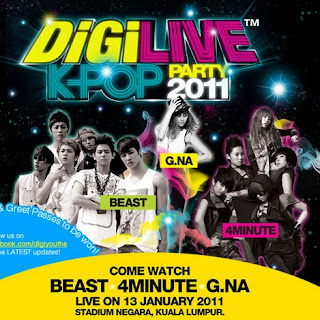 Got your passes for DiGi LIVE Kpop Party 2011 passes during the pre sale earlier? Don't worry, if you missed the pre sale, you can still purchase your party passes at various outlets - DiGi Retail Centre at Sunway Pyramid, Rock Corners at The Gardens, and a few more outlets, check them out and share today! The Kpop party is not just about partying to your favourite K-Pop artist performing, you will also get the chance to have a meet and greet session with them! We're talking about once in a lifetime experience! How do you join this meet and greet session contest? You just need to look out the details under 'Meet & Greet Contest". Do share this with your crazy K-Pop addicts! Till then enjoy rocking with the K-Pop! There's a gift for 100 early birds as well as lucky draw for those who bought it! Spread the word! untuk maklumat lanjut boleh klik je kat banner di atas.